Note: This site is not run by or affiliated with USP Labs in anyway. No statements on this site are endorsed or approved by USPlabs LLC and are the sole property of this site's owner. Yok3d – New MASSIVE PUMP Product Now Out From USPLabs! Here’s a nitric oxide supplement we’ve been waiting for MONTHS to get our hands on! Yok3d, developed by USPLabs, the same guys who brought you Jack3d and Pink Magic – has been generating a steady buzz around the bodybuilding community with a promise of introducing a new level of mind-blowing pumps and increased physical performance during your workouts. But First, What Makes USPLabs Yok3d DIFFERENT From EVERY OTHER Nitric Oxide Pill In The World? To understand why Yok3d is more effective than any other nitric oxide supplement on the shelf today, all we have to do is take a look at the Yok3d ingredients. The proprietary blend is rather simple – but the ingredients are not like any you’ll find in a current nitric oxide pump supplement. The primary ingredient is arginine nitrate – and although we see arginine in any good N.O. 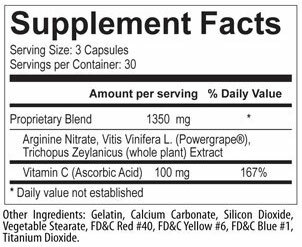 supplement as a primary ingredient – arginine nitrate is a first. The addition of the nitrate ion to the already effective amino acid l-arginine allows for BOTH the l-arginine and nitrate to create nitric oxide within the body. More nitric oxide in your body means further vasodilation, which means more nutrient and blood flow to the muscles – ultimately giving you those record-shattering intense pumps that every active bodybuilder longs for and loves. Up until this point – all N.O. products have relied on the traditional L-Arginine pathway to create elevated levels of nitric oxide in your body. The nitrate ion addition allows for generation of N.O. through several new enzymatic AND non-enzymatic – making this, in some respects, the improved and best overall way to increase your N.O. levels! But increased nitric oxide isn’t the only interesting new twist – Yok3d also has a solid foundation of plant extracts to support the formula and push our lifting efforts further. Vitis vinifera, also known as grape seed extract, is rich in antioxidants and produces/fortifies elastin and collagen which help make up the connective tissue within the muscle. The other important ingredient to mention is Trichopus Zeylanicus – as this is really the first time we’ve ever seen it in a supplement! This Malaysian plant has been used for ages by the indigenous habitants of the land and the Malayalam name of the plant is “Arogya pacha”, literally means “the green that gives strength”. The plant contains flavonoid glycosides, glycolipids and some other non-steroidal compounds with significant anti-fatigue properties, giving you that needed crank of energy, heightened focus and extended endurance. So How Does It FEEL To Be Yok3d? Who is it for? First off – you’ll instantly recognize the different feeling in taking Yok3d, and every other N.O. supplement on the market. Long gone are the days of the shallow pumps that make your muscles feel hollow, bloated and barely get you to the halfway point of your work out. When you take Yok3d – your muscles feel thick, full and dense throughout the workout. In fact – most of the beta testers said that they felt the pump way past their workout into the rest of the day! That’s the feeling every bodybuilder lives for! USP Labs Yok3d delivers explosive power and immense reserves of pure energy to get you through the toughest workout – making it the ideal pre-workout supplement for anyone ACTIVELY TRYING TO PUT ON MASS, GAIN STRENGTH OR BRING THE PLEASURE BACK INTO THEIR WORKOUT! Contrary to some rumours – Yok3d is not a dietary supplement and does not have any ingredients that promote fat loss. Sure, the feeling of raw energy will probably have you pushing harder and causing a higher heart rate, ultimately burning more calories than you ever would dragging yourself through a workout – but at the end of the day, the formula is designed to give you the most pump for the ultimate lifting experience and does not increase rate of fat burning in any way. Yok3d Side Effects? Not That Anybody Knows Of! Putting aside the fact that USPLabs is known for the massive research and care put into each of its products – Yok3d has one of the “cleanest” ingredient lists we’ve ever seen! Other N.O. supplements are sometimes loaded with artificial coloring to turn your insides every color of the rainbow, pesky ingredients like maltodextrin – a high-glycemic carb that causes high insulin spikes, leading to extra fat storage you have to fight through, and outrageous amounts of magnesium, the reason for any soft stools you may have experienced with past N.O. products. Noted Side Effects – Overtraining, if you want to call it a side effect? This stuff makes you want to work, PERIOD! — Hefsinthegym, one of the USPLabs Yok3d beta testers. 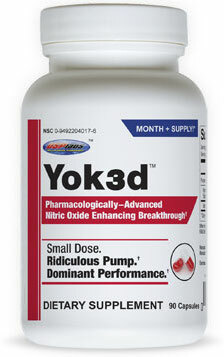 As far as Yok3d goes though, there have been zero side effects reported by USPLabs and every beta tester to-date. Not even soft stools! We did manage to dig up ONE documented side effect – but we didn’t feel it was all that negative (see box to the right). This is perhaps one of the biggest challenges for a majority of people actively taking N.O. supplements – but it doesn’t have to be an issue for you as long as understand the simple science behind it. Most people will take their N.O. supplement 15-45 minutes before their workout and go on to feel little to no pump during their workout WHILE wasting much of the efficacy of the product at the same time. The reality of the matter is studies have shown that while nitrate levels begin to increase as early as 10 minutes post-consumption, and peak anywhere from 30 minutes to 1.5 hours – the nitric oxide we’re chasing after is derived from NITRITE – the reduced product of nitrate. This means that you actually want your nitrite levels to be highest when you’re working out – since nitrite is first in line for conversion to N.O. When evaluating N.O. levels in a body after nitrate administration – the actual studies have shown that nitric oxide did not begin to increase DRAMATICALLY until 1-2 hours post-consumption – and peaked at 2-3 hours post-consumption! In other words – you have to wait a few of hours for Yok3d to “unlock” within your body to start fueling you to the fullest. To make things easier – each bottle of Yok3d comes with full dosing and timing instructions for all weight groups. Knowing WHY you’re waiting will simply make it easy for you to follow the specified timing and dosing – allowing you to “unlock” the benefits of Yok3d for the perfect-pump workout each and every time! Can I stack Yok3d with Jack3d? With how inexpensive Jack3d is, you’d be crazy not to stack it with Yok3d. Jack3d is more of an “energy and focus” product that provides some pump. Figure out your optimal dosage timing, mix these two together, and it’s absolutely lights out! Best of All – Yok3d Kills It In The “Value” Department! This is where Yok3d pulls ahead of whatever competition hasn’t been left in the dust yet. USPLabs are sympathetic to the cause of the poor bodybuilder that ends up spending hundreds and hundreds on supplements every month. With a track record of rolling out terrific products at affordable prices unheard of in the supplement industry (Jack3d has 45 servings and costs under $25!) – they’re the company that gives you the best bang (or in this case pump) for your buck every time! Each bottle of Yok3d comes in a 30-day supply, and costs around $40 – making this not only the best performing N.O. supplement to hit the market – but one of the most affordable ones as well! Overall – if you’re ready for mind-blowing pumps to start banging out NEW daily personal records while getting the most pleasure you’ve gotten out of a workout in years at the same time – you have to try Yok3d! Once you do – you’ll never go back to a lesser N.O. supplement again! New Yok3d Video from Marc Lobliner at TigerFitness! TigerFitness has had the lowest price on Yok3d since it came out, so support them when buying it! Save 40% off Retail when Buying Online!! Intermittent Fasting with JACK3D – Can I Take It? Jack3d Beanies – Where Can I Get One?! 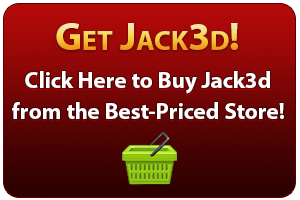 Will Jack3d help me lose weight? Or is this for Bulking?? How Much Beta Alanine and Arginine in Jack3d?